Previously on “Another 80 Gays” : The favourite opera of 63) Siegfried Wagner (1869-1930) was “Tannhäuser”, the tale of a medieval minstrel whose songs were included in a collection with those of “Der Püller”, the ancestor of 64) Richard Püller von Hohenburg (d.1482), whose execution was manipulated by the Mayor of Zurich, whose current office holder is 65) Corine Mauch (b.1960). 65) Corine Mauch has been Mayor of Zurich since March 2009. She had a perfect political female role model in her mother, Ursula, who was leader of the Social Democratic Party in the Swiss parliament from 1969-1995. Corine was first elected to the Zurich city council in 1999. From there, she has stated, it was the right step for her to eventually campaign for mayoral office. That chance came in the 2009 election. The Mayor of Zurich at the time did not seek re-election. Corine won 58% of the public vote, thus becoming the first female Mayor of Zurich. She won re-election for another term of office in March this year. Also in March she was placed on the long list of nominations for the biennial award of World Mayor. Despite the inference, the title of World Mayor is not a contest to determine who is Mayor of the World. It is an award where the public vote for the mayor they think has done the most for his or her community. It’s like the Oscar for the Best Mayor. The award is given by the City Mayor Foundation, an independent charitable organisation formed in 2003. It’s a kind of international think-tank with committee members from all over the world. It produces statistics on a range of issues such as environmental, economic and demographic state of major cities. Not all mayors are eligible for the World Mayor award. As the Foundation’s name suggests only cities and major urban authorities are included. Smaller towns and villages are not eligible. Corine Mauch has appeared on the long list of nominations once before. She was nominated in 2014 on a list which also included Annise Parker, Mayor of Houston, Texas, the only other lgbt mayor on that year’s list. Since 2006 the list has always included at least one lgbt mayor. 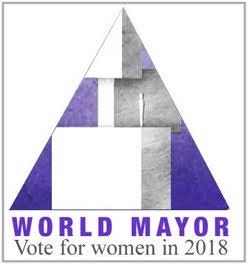 The long list of 63 nominations for World Mayor 2018 was released in March and included three openly lesbian mayors. As well as Corine Mauch there was Ana Colau Ballano, Mayor of Barcelona (who was also on the long list in 2016), and Jackie Biskupski, Mayor of Salt Lake City. In the summer the long list was whittled down to a short list of 27, on which Corine Mauch and Ana Colau Ballano appear. Voting continues throughout November, after which the votes will be counted and testimonials judged to produce a combined result. Fingers crossed for the New Year when either Corine of Anna could become World Mayor 2018. The World Mayor lists in the past have also included four gay or bisexual men. Germany has produced two of them. Klaus Wowerwit (b.1953), Mayor of Berlin, made it onto the short list of the inaugural World Mayor award in 2004. Most recently the First Mayor of Hamburg, 66) Ole von Beust (b.1955) has reached the short list. Like Corine Mauch, Ole von Beust has a political family background. He is descended from Friedrich von Beust (1809-1888), the Minister-President of the Austrian parliament, the Head of Government of the Austro-Hungarian Empire. Ole was first elected to the Hamburg parliament in 1978. His first term of office as First Mayor was in 2001. This first term was not without controversy. A scandal erupted involving him and Ronald Schill, the Vice Mayor, over one of Schill’s officials that Ole had fired over allegations of misconduct. Schill went on the offensive and accused Mayor Ole of abusing his power by having an affair with a man and appointing him a minister of justice. After several public exchanges, denials and counter-accusations Schill admitted that his allegations were unfounded. The affair only brought Mayor Ole’s sexuality into the public eye. In 2009 Mayor Ole was nominated for the 2010 World Mayor award. He made it onto the short list. However, before the short list was published he resigned from office. The rules of the award stipulated that only mayors who were in office on 22nd September were eligible for the 2010 award. Ole resigned on 25th August. However, because he had made it onto the short list his name was published with the other nominations but could not receive votes. Despite not becoming World Mayor Ole von Beust had established an international reputation and respect. This was not only based on his civic position and political achievements but also on his nationality. People of German heritage can be found all over the world. In this multicultural world in which we live communities have sought to keep their individual heritage alive. The USA is one of the most multicultural nations in the world and many communities celebrate their heritage with special occasions. In 2006 Ole von Beust was invited to a celebration of German heritage in New York City. It was as Guest of Honour at the annual Von Steuben Day parade. This special day takes place all over the USA where there is a high percentage of people with German heritage or a love of all things German. The day is named after the Prussian general who joined the American Revolution and laid the foundations of the US army, 67) Baron Friedrich von Steuben (1730-1794). Next time : We get the Prussian Blues with some failed relationships and unfulfilled dreams.